Completing a Life Cycle. From the spring crop of bok choy (Brassica rapa), I left two plants to complete their life cycle - seed to seed. The plants produced bright yellow flowers, they were pollinated. About 24 hours after pollination fertilization of the egg has occurred. Flowers turned into capsulated fruits which contained seeds. Dry and Alive. When the pods turn brown then they are ready to be detached from the plant. They were allowed to dry on the plant before they were harvested. The seeds needed to be completely dry to maintain their viability. At this point the seeds are capable of germinating once required environmental conditions are met. Carpels in a silique are separated by translucent tissue called replum. House of Seeds. The seed pods of the bok choy are called siliques. Siliques are made of two carpels which are separated by a thin film called replum as seen on the photo below I counted 12 to 20 seeds contained in each silique and there are a lot of siliques per plant. Home-grown seeds ready for planting. Home-Grown. After getting the seeds that I need for this planting, I am keeping some for next spring. The fall crop may not be able to flower since we are approaching shorter daylength. (If I remember right, the spring crop bolted at 15 hours daylength.) This practice of collecting seeds from your own crop helps save money. The only time when this may not be recommended is when you are dealing with hybrids. Seeds collected from hybrid plants are not guaranteed to perform the same as their parents. Egg cartons were used to germinate the seeds. Recycled. Egg cartons are easy to come by; they are biodegradable and their little compartments are large enough to support the fast growing seedlings until they are ready to transplant. At planting time the sections that contain the seedlings will be separated by tearing the carton without disturbing the roots. Tiny seeds meet the soil. Fast Crop. The good thing about bok choy is that there is hardly any dormancy period. Immediately after the seeds are mature and dry, the seeds are ready to start life. That is the reason I am planting again because I am almost certain that the plants will reach harvestable age before the weather gets cold. Two days after sowing the seeds - a new plant. A new life has begun...a month from now the food will meet the kitchen...again. These are no happy days for my summer squash - they are being "harassed" by powdery mildew. There are different species of powdery mildew and they are plant-specific. For example Erysiphe cruciferarum will infect crucifers while Erysiphe pisi prefers peas. The pathogens that cause powdery mildew are unique from most leaf-infecting diseases because their spores do not require free water to germinate. As a result they can infect their host plants in very dry condition such as ours. That is why in a time when blackspots and peach curl are all wiped off by the lack of moisture, powdery mildew is thriving happily. The strength of this pathogen to withstand the lack of water can be totally reversed by water itself. Hosing the leaves with water will do the trick depending on the severity or stage of the infection. The time will come when the two meet again. And yet it is not without difficulty for the Eureka fog often clouds the way. It stretches out its leaves to embrace the warmth of the magnificent brilliance of the morning. The flowers blush as the sun's rays touch their petals. Translucently delicate flowers float above the dark green scalloped leaves. Grandma says - it has a name that sounds like a disease but the streptocarpus blooms all year. With such gorgeous flowers it will surely brighten a gloomy day. There is something about that name. One of the plants that caught my attention during our recent trip to Eureka was the Streptocarpus. Although the name sounds like a strain of bacteria that infects the throat, this plant is safe to touch. The name Streptocarpus comes from two Greek words (streptos which means twisted; carpus which means fruit) which refers to the twisted seed pod of the plant. The twisting happens during the development of the pod as in the spiraling of tendrils. Differential cell growth and interplay of plant hormones are responsible for this type of development in plants for a reason. It appears that the twisting of the Streptocarpus pod releases the seeds as a natural mechanism for dispersal. It's amazing to know that the God of the universe made sure that even this tiny plant was given a blueprint for a perfect life. This plant grows very close to the ground until it starts to bolt. Then it sends out its flower up high for everyone to see. This picture was taken at the UC Davis Arboretum a week ago. Lagenaria siceraria with nocturnal flowers. Problem. 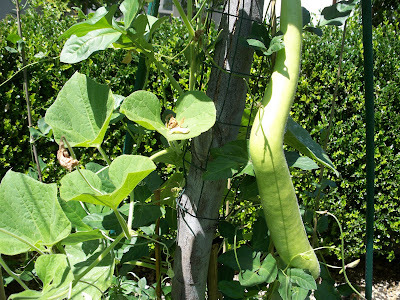 As I have mentioned earlier, I planted a variety of bottle gourd in my yard last spring and have successfully raised it to reproductive phase. Hooray! Several flowers - both staminate and pistillate have been forming daily starting from an early stage. However, only one fruit per plant has developed and matured so far. Back in the olden days in my grandfather's garden, I remember seeing several of green gourds of various sizes hang on trellises. Using small twig, I used to write my name or draw hearts on the gourds that I can reach. What's wrong with my plants? How come fruit setting is so poor with my own plants? I have made observations that might explain the sparse fruiting in spite of the flowers. Explanation. The Lagenaria siceraria bears flowers that open at night. They start to open at about 6:00 pm and remain open till the next morning - when they get spent under the scorching sun. Consequently, pollination happens at night also. The plant depends on a nocturnal insect to pollinate its flowers. Hawk moth has been reported to pollinate gourds. Although I have not made the observation myself, this idea makes sense as most species of moths are nocturnal (they are active at night). But there's one problem - with our dry climate, there is a lower population of these night-time pollinators in the area. My theory is that the problem is due to limited night-time pollinators. Solution. When planting Lagenaria siceraria in the future I will also include planting more plants that open at night to attract night-time pollinators in my garden. If my theory is right, then increased attractants should result in more fruits. White Flowers attracts nocturnal pollinators. The Lagenaria siceraria produces well in a tropical environment but not in the semi-arid conditions of my garden. Sometimes we transfer an organism from one to another location and expect that it would behave similarly. Unless we can simulate the conditions of the old place then we are just dreaming. A tomato from my garden. When you blog you are sure to stir curiosity within your community. Recently I've stepped into Blotanical - "the city of botanist who blog". Some of my new acquaintances have been wondering where in California I garden. I though that an answer that would stick is appropriate for this question. My tiny garden is located near The Big Tomato. Sacramento is The Big Tomato! It is in this area where more tomatoes are produced than anywhere else in the world. Now imagine driving thirty five minutes east of Sacramento - and you'll hit El Dorado Hills. That's where I garden. Tomatoes: A common summer-sight on the freeways around Sacramento. One more month of summer to go, the weather is still pleasantly warm and the plants are continuing to produce. Lower temperatures will allow the plants to even grow better up to certain point. Gardeners need to be aware that the change in daylength is going to be the determining factor whether to keep annual plants in the garden or not. The bell peppers are still producing - in fact the plants are too small for the yield that they produced. A simple tomato cage was used to prop the plant up. The green bell peppers are the immature version of the red, yellow or the orange bell peppers. I'm not sure if we could wait for the red color of the pepper. I can see Hamburger-Stuffed peppers as the destiny of these ones. It is interesting to note that these two varieties of peppers not only are different in the shape and size of their fruits but the growth habit of the fruits are contrasting. The bell peppers are growing downwards while the 'Fresno Chili' fruits point upwards. Could this be due to phytohormones or gravity? Increased occurence of female flowers. 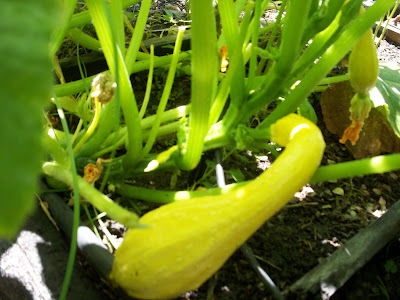 The summer squash (or zucchini) have been flowering for a while but production has been low up to this point. Fruits would come at a slow rate of one every couple of weeks. 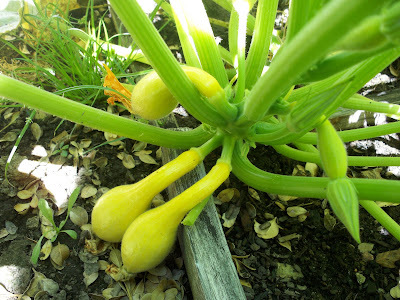 Unlike before when most of the flowers they produced were staminate (male), now several pistillate (female) flowers arise resulting in more zucchini fruits. In some cases the cause of low yields is the absence of male flowers. Commercial growers have to resort to using growth regulators to induce more male flowers. Even if they don't turn into fruits, staminate flowers are the source of pollen that fertilizes the pistillate ones; without them there would be no fruit production. I purchased unlabelled eggplant seedlings from the farmers market last spring. I am not sure what variety they were. The vendor told me that it was a Japanese eggplant. I was going to assume that it is 'Ichiban', a variety I am very familiar with, but the leaves were not the same. The growth habit was different and now the fruits do not have the dark sepal. Whatever variety it is, this plant looks very prolific considering how sparse the leaves are. The tomatoes are continuing to grow. The relatively cooler temperature this year is conducive for fruit setting. It does not look like they are going to slow down anytime soon. However, the shorter photoperiods will soon interfere with the photosynthetic rate of the plants. I have six tomato plants and we harvest way more than we can eat. We have to get creative in the way we use them. I found out that the best ways to our good utilize the bigger tomatoes is to make Bruschetta. In our house, cherry tomatoes are eaten like grapes for snacks. My kids would watch TV with a bowl of tomatoes on their laps. Who needs junk food when the tomatoes are so sweet? Here in California the weather is so mild that tomato plants can remain green till Thanksgiving. However, the fruits will grow at a much slower rate due to the shorter periods of exposure to sunlight as the days get shorter. Eating home-grown foods are in. Enjoy the fruits of your garden while they last. Careful not to let anything out of the bag, my husband and I packed our kids and drove 350 miles to Fortuna, California to surprise my mother-in-law on her 63rd birthday. We knew they were in town on that day but when we got there nobody was home. So we waited...we tied some birthday balloons on their railings. Although the gate to the backyard was closed it did not require much from us to open it and go take a peek into her beautiful garden. My children entertained themselves by collecting frogs and bugs while my husband and I went to Starbucks for coffee. One thing that is very notable in her garden is the spread of avian-themed ornaments throughout the place. There is art in the placement of any ornament and she seems to have mastered it beyond my ability to emulate. It is such a delight to be surprised by a pair or family of birds in every little corner of the garden. There are so many of them that I began to wonder which is her true hobby - gardening or bird watching? Just like in the interior of our homes, the things we put in our gardens speak about us. It appears that a gardener's success in garden ornaments depends on our choices is based on what we really like instead of what might be pleasing. Birds on a lunch break. Birds playing in the tool shed. Garden ornaments such as these bird sculptures add a finished look to any garden. Young roots from stem cuttings. Root growth from a stem cutting or a seed comes from within. The stimulus for root growth is brought about by external factors such as air, temperatures and moisture. Deep within the tissues - a reaction is triggered. The root is only an expression of that internal changes that happens deep within. Similarly, any passion or desire to do anything is not forced. Instead it starts internally as a response to ones experiences. One of the amazing things that happened this summer is the conversion of my children into plant propagators. This happened after visiting Filoli gardens and seeing the succulents displayed for sale. Suddenly they believed that they can make money by cloning and selling plants. They have responded to the stimulus around them. The things that they see me do on a day to day basis and the promise of earning money as exemplified by a public garden (Filoli) triggered a response in them. Now every morning they would go out in the garden and water their own plants. 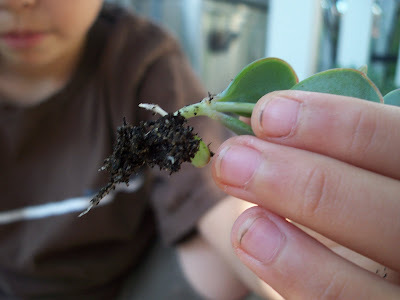 Just like a seed or stem on the ground, my kids are beginning to root. My role is to continue to provide them with favorable environment for this new passion to grow deeper. If my children are interested in gardening then I must have contributed slightly to the initial influence that triggered them to think about it. Roots getting ready to explore wider and deeper. Have you influenced someone's roots to emerge? 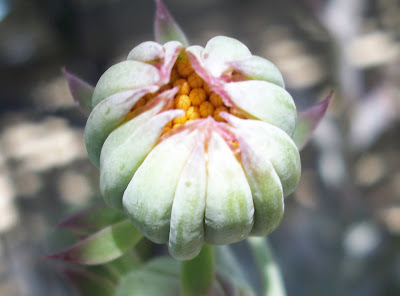 This is the flower of a succulent plant from the Senecio species. Other plants under this family look different from this plant. There are several plants classified under the group and the only possible resemblance of the 'Oribi Gorge' with other plants that I see would be the characteristics of their flowers. Senecio is derived from a Latin word senex meaning old man which could be seen in the fluffy white seed heads of senecio plants plants. If you look at the picture above, you can see a glimpse of the individual flowers within a flower. Each of those tiny yellow flowers is capable of being fertilized and becoming seeds called achenes. For the 'Oribi Gorge' I still have to see what happens. Right now the flower is opening at a very slow rate measured only in nanometers (nm) per day. While we wait therefore, I invite you to focus on appreciating the beautiful architecture of its flowers. The 'Oribi Gorge' was named after the place where it was discovered in South Africa. 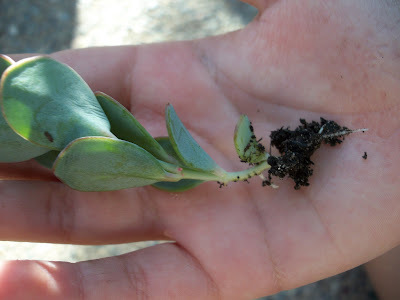 Although it is a succulent, it prefers to be watered well during the hotter months to look beautiful. Volunteer plants are those that grow in the garden even in the absence of intentional care. Volunteers arise from plants whose seeds and vegetative parts (such as rhizomes, tubers, roots and stems) survive under neglect. This is natures' way of maintaining vegetation on this planet. But when gardeners were born and their designs were printed, some of these volunteers have been labeled as weeds. In my garden potatoes would grow voluntarily every year even if I only planted once. These are the potatoes that skipped my trowel during the previous harvest. Early in the spring they would sprout right where they were left. After three to four months when the leaves begin to turn yellow, we are ready to unearth the goodness that lies underneath the soil. Today I will use these volunteer potatoes to share some useful lessons in gardening that I learned over the years. Did I mention that I once was a potato scientist working with the International Potato Center in my younger days? Potato (Solanum tuberosum): Tubers were very close to the soil surface. A tuber hangs among many roots. Tuber. The part of the potato that we eat is called a tuber. It is a modified stem...not a root. That's right the potato is technically a stem. Tubers grow from a stolon which is a stem that grows underground. This can be easily distinguished from the roots by their size and color. Stolons are white and are much thicker than the roots. Tuber - "Bigger than my hand!" Eyes. The indentations on the potato tubers are called eyes. Although they cannot see, believe me these eyes have brows. :) Observe them the next time you peel some potatoes. The eyes are the nodes of the modified stem. On a regular stem, this is where branches would come out. That is why when you keep your potatoes in your pantry for a long time, sprouts would come out. If you plant those sprouting potatoes, those sprouts become the plants. Did you know that potato varieties with deeper eyes are less desirable than their shallow-eyed counterparts? Tubers harvested from one potato plant. Greening. Notice that the potatoes although harvested from the same plant did not have the same colors. Some of them are green. Greening in potatoes is the development of chlorophyll on the tubers caused by the exposure of the tubers to light. The absence of hilling-up (raising the soil around the base of the plant) on these potatoes resulted in tubers that grow very close to the soil surface and thus exposure to sunlight. To prevent greening - always store your food potatoes in a dark place or cover them with a towel. I don't recommend eating potatoes that show signs of greening for these reasons: they don't taste good; they don't cook easily; and most of all they contain some amounts of toxic substances (glycoalkaloids). Lenticels. These are small openings on plant tissues that allow gas exchange. In other words, they likened to the nostrils. The bumps seen in the picture above are not diseases; they lenticels that have been enlarged. The volunteer potato that we harvested was growing next to a leak in the drip line which created an anaerobic (absence of air) condition within the soil. The lenticels had to open, as flared nostrils, in search of oxygen. This is what happens when plants are over-watered - the lenticels swell and they can be a convenient entrance for microorganisms. I have to stop here but expect for more posts on potato-related topics in the future. Birds have decided to help themselves to my tomatoes. Just because we still have a basketful of tomatoes in the kitchen does not mean that I should stop harvesting them. Some of my garden friends - the birds, are more than willing to help themselves to the fruits as soon as they see the color turns appetizing. Birds like to eat the fruits on the upper portion of the tomato plant.